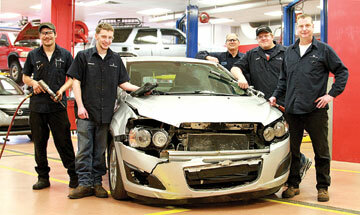 Pictured here with the totaled 2014 Chevy Sonic are, from left to right, auto students Scott Moxham of Minocqua, Dakota Oettinger of Eagle River, auto Instructor Ken Duesing and students Steven Hansen of Arbor Vitae and Joseph Blaser of Rhinelander. Nicolet College students in the automotive technician program now have two additional vehicles to use to advance their skills thanks to a recent donation by State Farm. Both the 2014 Chevrolet Sonic and the 2012 Nissan Versa were totaled in crashes, providing students with the opportunity to learn how to repair multiple vehicle systems, Nicolet auto instructor Ken Duesing explained in a press release. "Vehicles like this, in this condition, are perfect for our students," Duesing said. "This is about as real-world as it gets which makes them very valuable for students to work on as they learn new skills." Nicolet's automotive technician program currently has about 20 vehicles in its fleet for student training. "It's important for students to work on many different types of vehicles, to see how each is different, and to give them that broad base of training that will help them be successful in their careers," explained Duesing, who is a ASE Master Technician and GM World Class certified with 22 years of experience working in a dealership. "The more diverse the set of vehicles students can work on the better. This is a fabulous donation by State Farm that will definitely benefit students." Duesing has taught at Nicolet since 2012. This is the third time State Farm has donated totaled vehicles to the college. Past donations have included a 2013 Dodge Avenger, 2012 Ford Focus, and a 2006 Chevy Silverado. Nicolet's auto program is accredited by the National Automotive Technicians Education Foundation, which has specific requirements on the types of fleet vehicles students train on. "All of the vehicles donated have helped Nicolet meet that requirement, which is a significant benefit to the college as well," Duesing noted.